PLACEBO RETURN TO SCOTLAND TO PLAY SOLD OUT CONCERT AT DUNDEE'S CAIRD HALL AS PART OF THEIR 20TH ANNIVERSARY OF THE BAND. 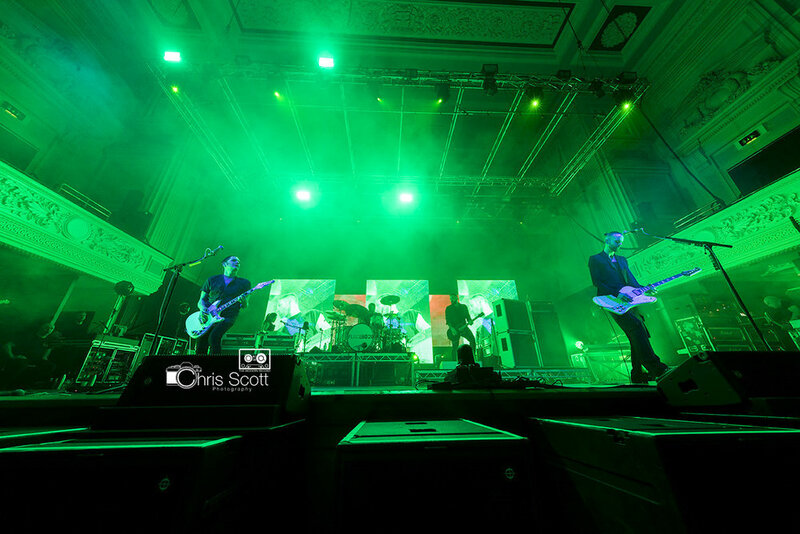 The crowds that were camped out on the steps of the Caird Hall by Placebo's devoted fans was a telling tale of what to expect at Placebo's second home here in Dundee. The pair know the city pretty well, especially Brian Molko who spent some time growing up here in the city. They have a huge fan base in the city who were out in full force on Sunday to catch the band on their Dundee leg of their latest tour reliving some 20 years of material. Supported by the Husky Loops a 3-piece thrashing lively band from Bologna, based out of London were a good introduction to the night, but the real support band with Dundee connections, "Mirror Trap" were sorely missed. Huskey Loops filled a very tight spot and did so admirably to a tough crowd. They finished their set as they had started, loud, fast and won the crowd round with a really good performance. Then came the main act, Placebo. The crowd went wild as the video introduction to the band coming on. The place was pretty much packed to the rafters and then boom, Drummer, guitarist followed on stage by the lovely Angela Chan. Stefan Osdal appeared bold and appreciative of the large crowd, coming right onto the front stage speakers to get as close to the fans as possible. hen Brian followed and just belted into the first track "Pure Morning" which went down well. This was quickly followed by "Loud Like Love", "Jesus Son" and then "Soulmates". It probably took the band 2-3 songs to relax, but by the time they belted out "Special Needs" they were in full flow and the crowd reacted just amazingly hanging on to every word and mirroring the talented front man. "Too many friends" was next, with the crowd participation just getting better and better. Everyone was jumping, the bass player, keyboard player and even security joining in. You can tell what a serious band they are musically, when the guitar techs are just as busy as the band. Pretty much changing guitars on every song. By this time, you could feel the devotion of the crowd singing every word. Really good intro on keyboard for "20 Years", a stunning story that was sung very well. This slowed things down a bit then wallop they just exploded, amazing guitaring, the type that just gives you goose bumps. The place went mental when 20 Years was quickly followed up by "Devil in the Detail" another classic which got the crowd going. The one thing about this band is they know their music, they are tight and just keep going, you could hardly take a breath before the next tune starts again. Even though it's manic it's a controlled unhurried manic and that's why they are a stand out band 20 years on. "Space Monkey" was eloquently delivered with the lightshow washing the crowd who's hands were up in the air into a sea of blue waves. "Exit Wounds" was next up. Brian was really into the flow of the gig at this time, feeling every word with his signature hand gestures. This was followed up by "Protect me from what I know" A brilliant moment when Brian was singing this while playing the guitar one handed, with the other hand out to the crowd. "Without You I'm Nothing" was next, with some humbling video footage of the great man David Bowie in the background. This was a lump in the throat version which you could feel meant a lot to the band and the crowd, a truly humbling moment. "For What it's Worth" was next, big lights, crowd hand clapping in unison. I thought the crowd needed a bit of egging on at times, but for this number, they were as one. Awesome guitar rift and a jumping crowd had everyone up on their feet. "Slave to the Wage" was next on the extraordinary set of Placebo classics, that just kept coming and coming. "Special K" followed which had the crowd interacting with the band shouting "What" right on cue. Awesome drumming display for this tune. "Song to Say Goodbye" was delivered faultlessly and powerfully, just a brilliant example of a top-quality band who have gained and lost nothing over their 20years. "The Bitter End" was next and this was song of the night for me, just everything about it was right. It made you feel part of something special and I'm sure the sell-out crowd would totally agree. Energy, vibe and crowd singing made this a special number for me. This ended the gig and the band walked off for a well-deserved break. The crowd were shouting for more and Placebo came back on to "Teenage Angst" and you could see what it meant to the crowd. Hands were on hearts, mates were hugging, strangers were connecting to a tune that meant an awful lot their fan base and again to the band. It was great to see the bands head of security walking up and down the pit ensuring the fans at the front had water and fantastic to see the fans passing that water to their neighbour. Stefan came out with the rainbow coloured bass and held it up to the crowd above his head, this could only mean one thing. "Nancy Boy" People in the crowd were on shoulders and the lyrics were reverberated around the Caird Hall with class and style. A true iconic tune that the fans will always want to hear. "Infrared" was the final tune of the encore and everyone was on their feet dancing, across the stalls people were up, completely appreciative of the gig they had just witnessed. Brilliant end to a brilliant night. Band went off and the crowd were not having any of it. They waited and waited while the roadies were unplugging guitars and then for one last song of a brilliant gig, they sang the brilliant Kate Bush song "Running Up that Hill" which really stood out. Amazing finale to an amazing gig. One of those "I was there gigs" Placebo after 20 years are still a no nonsense band that are still as fresh and as lively as they were when they started. 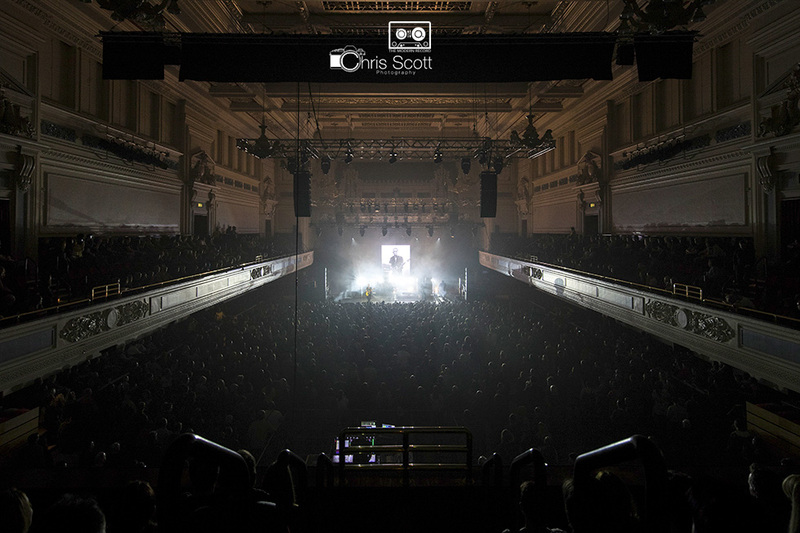 Graceful dark lyrics that really suited the Caird Hall. This would have been a completely different gig if it had been held at Slessor Gardens for example. Very well-rehearsed and musically, tighter than a submarine door. Considering how technically their music is, they perform and complement each other very well. Multi-tasking Angela, was keyboards, violin and backing singer, a true asset to the band. A great night for Dundee and if this performance is anything to go by, it will be a very successful tour for the band.